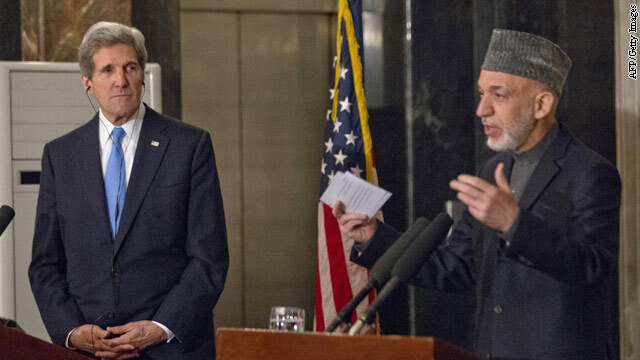 US Secretary of State John Kerry and Afghanistan President Hamid Karzai during news conference in Kabul. U.S. Secretary of State John Kerry made a previously unannounced visit to Afghanistan on Monday to repair strained relations with President Hamid Karzai as the American-led international force continues to prepare to end its combat mission next year. Kerry's stop came on the same day that U.S. forces turned over control of a prison that has caused tension between the two nations, with Americans retaining a say on the handling of certain Taliban inmates. The talks on Monday followed controversial comments by Karzai in recent weeks that seemed to accuse U.S. forces of working with the Taliban to kill Afghan civilians, a charge denied by U.S. officials. Karzai's reported remarks caused outrage in Washington with some in Congress questioning why the United States should continue the war effort. At a joint news conference after meeting Kerry, Karzai said he had been misinterpreted when quoted as alleging collusion between the Americans and the Taliban.